In 10-inch skillet, cook bacon over medium-high heat 8 to 10 minutes or until crisp; drain on paper towels, reserving 2 tablespoons drippings. Crumble bacon; set aside. In large microwavable bowl, stir together mashed potatoes, reserved bacon drippings, the milk, pepper Jack cheese, cream cheese, pepper and 2 cups of the Cheddar cheese. Microwave uncovered on High 4 minutes. Stir in sour cream and chiles until well blended. Spoon potato mixture into baking dish. Sprinkle with bacon and remaining 1 cup Cheddar cheese. Spoon pork evenly over cheese. 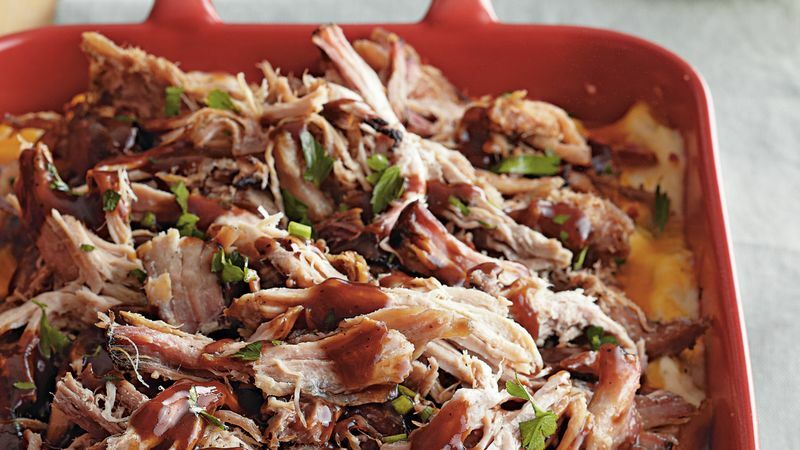 Drizzle barbecue sauce over pork. Bake uncovered 45 minutes or until bubbly. Let stand 10 minutes before serving. Garnish with parsley.